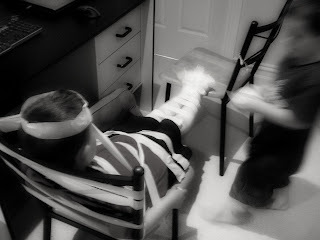 Yes: two boys and a roll of (non-washi) masking tape. The elder completely taped to the chair. I was forced to intervene at the end of this game, when I overheard Bargy saying to his older brother "Now Argy, you will have to be a brave boy". I'll leave you to imagine where the scissors were poised. Hehehe... I love that "...you will have to be a brave boy.."
lol I could jsut imagine my two brothers doing this when they were younger! Oh lordy....I wonder where those boys get their imaginations from? Oh yipee, you are back! 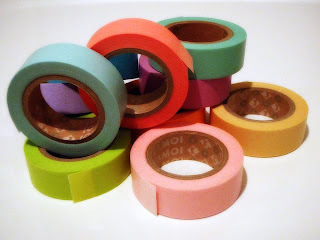 There is no way I'd bring washi tape into our house considering the rate at which it's cheaper cousins are unravelled (so far no siblings captured, just a gazillion creations from the recycling bin or general furniture items wrapped in tape. Does Argy have much in the way of leg hair? Just asking because I'm imagining whole worlds of pain. Oh, you'll have to keep that tape under lock and key! I am typing through tears of laughter! I love how you took the photo before rescuing! heh heh, committed blogger you! Isn't washi tape a bit pricey? double grrr! ooohh, ohhhh!! they are very imaginative little boys those two! Hello you! Glad to see you haven't been er... cut off. Never a dull moment at your joint! Glad to see you back in blogland. Hope to see you in real life soon too. oh dear, that nearly made me pee my pants a little!